Property Partner is one of the largest UK property crowdfunding platforms, along with Property Moose and The House Crowd. Of these three they have the most advanced secondary market, allowing investors in the platform to buy and sell their holdings in managed assets. Over the past few weeks we’ve seen lots of positive improvements on their end to give investors greater visibility on the current pricing and a chart of the last 100 transactions. 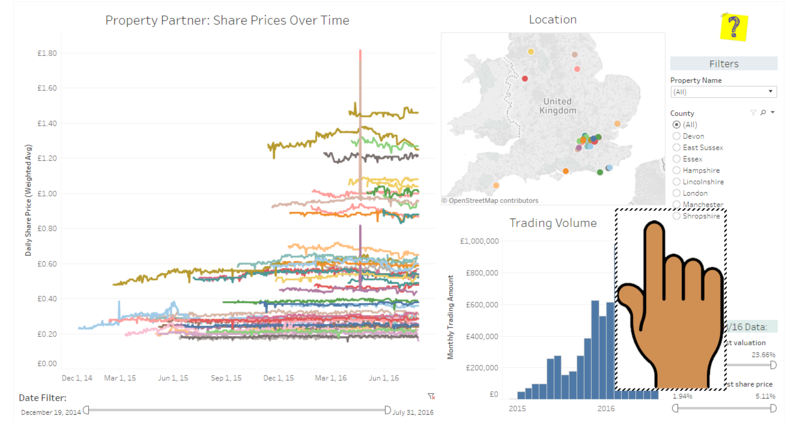 However, it’s still really useful to see how property share prices have changed since coming onto the secondary market, to compare and contrast amongst each other. Which is what I’ve prepared here! For the data, I used the July 2016 Open House figures, published on the Property Partner blog here. You can download all the transactional data in a zip file at the bottom. To come up with a daily share price I calculated a weighted average of all transactions, based upon total £ value. I added in metadata on the properties for filtering from the general property view here. 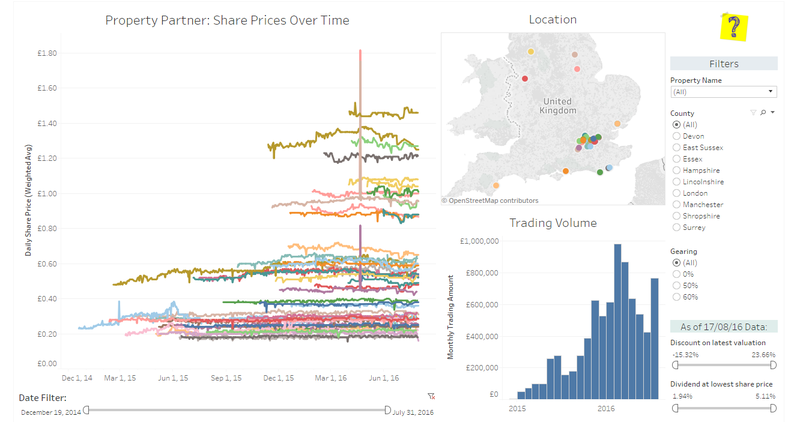 The data view has an excel download which was handy for the latest share price and valuation figures. Note that I have no official connection to Property Partner (other than being a user of their website). So, there could be some errors or misinterpretation of their data. If you have any doubts, you can cross reference with the raw data in their open house data above.